Choosing the right material for your fencing projects is difficult. We’re lucky enough to have a huge range of materials to choose from, but that makes the choice even harder. There’s aluminium, wood, modular, glass and of course, wrought iron. All of these options have their own benefits and drawbacks, but there is something magical about wrought iron. It’s been used to decorate houses for royalty and commoners, and there’s a reason why. 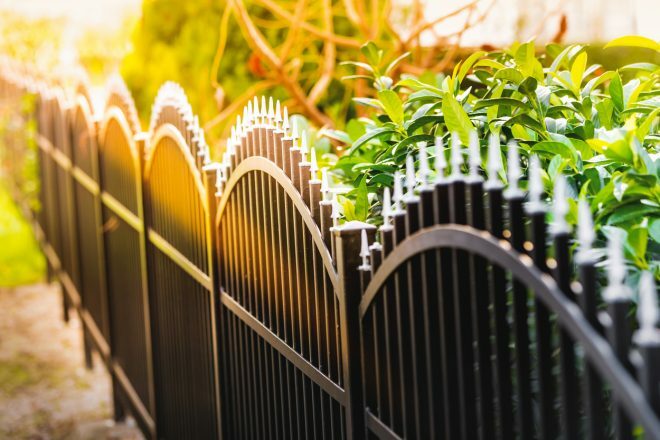 Read on for more information on wrought iron and see if this would be the perfect fencing material for your property. When choosing a fencing material, you have to think about how it will suit the rest of your home and your area. Luckily, wrought iron offers versatility. It is customisable so it can be made to satisfy both heritage and modern aesthetics and the colour options are neutral enough to suit a street full of established homes or a newer area. It also offers visibility, which makes it perfect for being used near gardens and other areas where an opaque fence would block a vital view or block out any necessary sunlight. It’s important to remember that this is your home, so the aesthetic is ultimately up to you. If you have always loved wrought iron fences go for it. The aesthetic works for you and that’s what matters. Do You Need a Secure Fencing Solution? Depending on the design, wrought iron can deliver on the security front. When made tall and smooth and topped with sharp posts, it makes for an imposing barrier. A wrought iron fence can be hard to climb over, under and through. The best part is, you can enjoy this security without having to go for a fortress-like, total security fence. Keep your property safe without ruining its aesthetic or sacrificing its curbside appeal and value. Wrought iron fences can be customised to suit your exact needs. You can choose the spacing, the curvature or lines, the powder coating, the height and almost anything else you can think of. We have our own fabrication plant too, so we literally can create almost anything. By using carbonised iron, we can bend and stretch each section into shape without weakening it. So, you don’t have to go straight over ornate and curvy to maintain strength. If you notice any chipping or dents, just grab some sandpaper and buff it out – it will look good as new! When it comes to cleaning, all you need is some hot and soapy, a sponge and a hose and it will look good as new forever. Compare this to wood, which is subject to peeling, cracking and rotting or brick fencing, which needs re-grouting, and you’ve got a low-maintenance option that will be the perfect investment for your property. Perhaps the only drawback of wrought iron fencing is that it can be expensive. Iron is more costly as a material than aluminium, wood other steel options. If you opt for a customised look, the cost of labour can add up. The weight of the material also needs the fencing site will require more preparation, which again adds to costs. With all that in mind, it’s also worth remembering that the longevity and beauty of wrought-iron means that expense will pay off and even turn out to be a small price over time. But, if the price is a problem, advanced powder coating options mean steel and aluminium can be used for a similar effect. Our expert fencing and fabrication team are always more than happy to give you some advice and talk you through your options. Wrought iron delivers on so many fronts. It offers all the security you need, without turning the perimeter of your home into a fortress. It protects your view, gives your garden plenty of sunlight and gives you a design feature you can enjoy for years.